Van Cliburn and his "groupies"
... he was 78-years-old when he died from bone cancer. 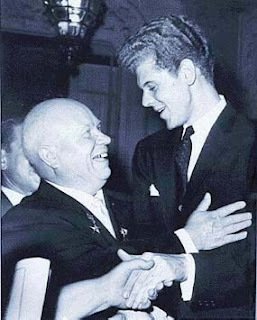 Harvey Lavan "Van" Cliburn, Jr. achieved worldwide recognition in 1958 at the age of twenty-three, when he won the first quadrennial International Tchaikovsky Piano Competition in Moscow, at the height of the Cold War. Van Cliburn was born in Shreveport, Louisiana, and began taking piano lessons at the age of three from his mother, the former Rildia Bee O'Bryan, who herself had been instructed by Arthur Friedheim, a pupil of Franz Liszt. At six years old, Cliburn moved with his family to Kilgore, Texas, and at twelve he won a statewide piano competition which enabled him to debut with the Houston Symphony Orchestra. He entered the Juilliard School at the age of seventeen, and studied under Rosina Lhévinne, who trained him in the tradition of the great Russian romantics. 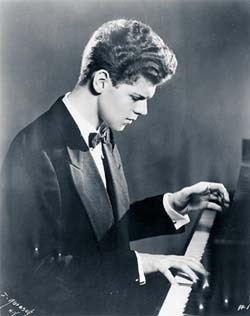 At twenty, Cliburn won the Leventritt Award, and made his Carnegie Hall debut. It was his recognition in Moscow that propelled Cliburn to international fame. The first International Tchaikovsky Competition in 1958 was an event designed to demonstrate Soviet cultural superiority during the Cold War, on the heels of their technological victory with the Sputnik launch in October 1957. 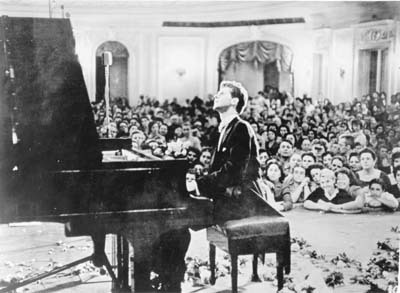 Cliburn's performance at the competition finale of Tchaikovsky's Piano Concerto No. 1 and Rachmaninoff's Piano Concerto No. 3 earned him a standing ovation lasting eight minutes. When it was time to announce a winner, the judges were obliged to ask permission of the Soviet leader Nikita Khrushchev to give first prize to an American. "Is he the best?" Khrushchev asked. "Then give him the prize!" Cliburn returned home to a ticker-tape parade in New York City, the only time the honor has been accorded a classical musician. His cover story in Time proclaimed him "The Texan Who Conquered Russia." RCA Victor signed him to an exclusive contract, and his subsequent recording of the Tchaikovsky Piano Concerto No. 1 became the first classical album to go platinum. It was the best-selling classical album in the world for more than a decade, eventually going triple-platinum. Cliburn won the 1958 Grammy Award for Best Classical Performance for this recording. In 2004, this recording was re-mastered from the original studio analogue tapes, and released in the highest quality ever on high-resolution Super Audio CD. Cliburn performed and recorded through the 1970s, but in 1978, after the deaths of his father and manager, began a hiatus from public life. In 1987, he was invited to perform at the White House for President Ronald Reagan and Soviet president Mikhail Gorbachev, and afterward was invited to open the 100th anniversary season of Carnegie Hall. 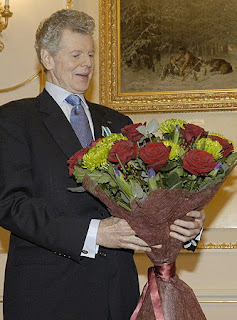 In 1994, Cliburn made a guest appearance in the cartoon Iron Man, playing himself in the episode "Silence My Companion, Death My Destination.” Now in his late seventies, he still gives a limited number of performances each year to critical and popular acclaim. ... she was 77-years-old when she passed away. Frances Rose Shore was born in Winchester, Tennessee on February 29, 1916. When she was two years old, she was stricken with polio, a disease that was not preventable at the time, and for which treatment was limited to bed rest. She recovered but had a deformed foot and limp, which did not physically impede her. At 14, Shore debuted as a torch singer at a Nashville night club only to find her parents sitting ringside, having been tipped off to their daughter's performance ahead of time. They allowed her to finish, but put her professional career on hold. She graduated from Vanderbilt University in 1938 with a degree in sociology. She also visited the Grand Ole Opry and made her radio debut on Nashville's WSM (AM) radio station in these years. Shore decided to return to pursuing her career in singing, so she went to New York City to audition for orchestras and radio stations, first on a summer break from Vanderbilt, and after graduation, for good. In many of her auditions, she sang the popular song "Dinah." 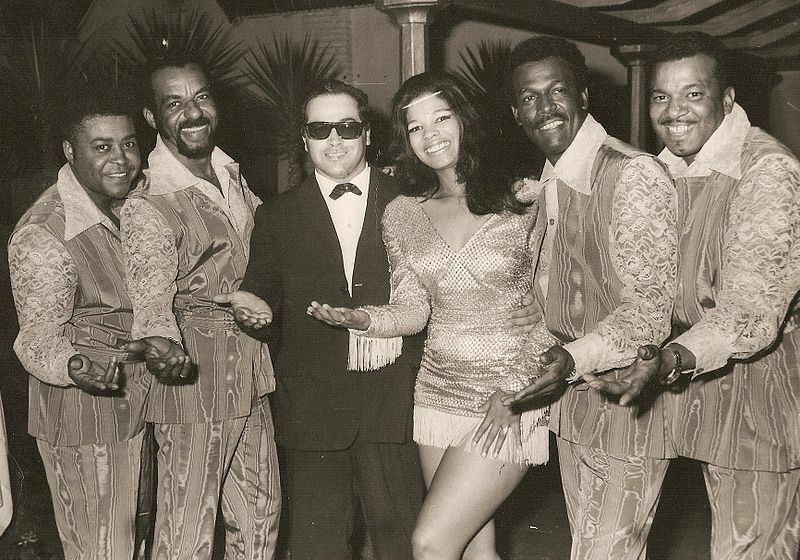 When disc jockey Martin Block could not remember her name, he called her the "Dinah girl," and soon after the name stuck, becoming her stage name. Shore eventually was hired as a vocalist at radio station WNEW, where she sang with Frank Sinatra. She recorded and performed with the Xavier Cugat orchestra, and signed a recording contract with RCA Victor Records in 1940. 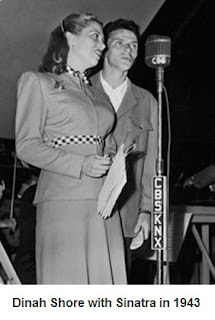 She reached the height of her popularity as a recording artist during the Big Band era of the 1940s and 1950s, but achieved even greater success a decade later, in television, mainly as hostess of a series of variety programs for Chevrolet. 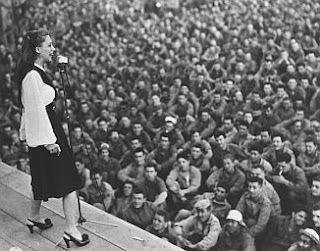 After failing singing auditions for the bands of Benny Goodman and both Jimmy Dorsey and his brother Tommy Dorsey, Shore struck out on her own to become the first singer of her era to achieve huge solo success. She had a string of 80 charted popular hits, lasting from 1940 into the late 1950s. 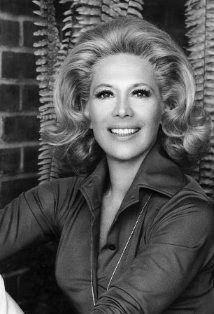 After appearing in a handful of films went on to a four-decade career in American television, starring in her own music and variety shows in the 1950s/60s and hosting two talk shows in the 1970s. From 1970 through 1980, Shore hosted Dinah's Place (1970–1974) on NBC and Dinah! (later Dinah and Friends) in syndication from 1974 through 1980 and a third cable program from 1989–1992. TV Guide magazine ranked her at #16 on their list of the top fifty television stars of all time. In the early 1970s, Shore had a long and happy public romance with actor Burt Reynolds, who was 20 years her junior. She died from ovarian cancer on February 24, 1994, in her home in Beverly Hills, California, five days before her 78th birthday. … born on May 31, 1938, he was 64-years-old when he died. Born in Greenfield, Ohio, Donald Eugene Lytle better known as Johnny Paycheck, was a country music singer and Grand Ole Opry member most famous for recording the David Allan Coe song "Take This Job and Shove It." Donald Lytle entered talent contests by the age of 9. 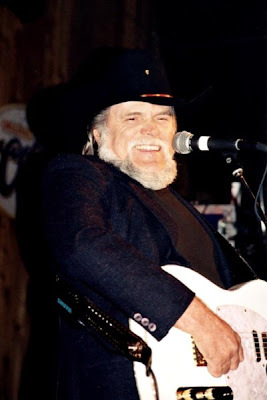 He achieved his greatest success in the 1970s as a major force in country music's "Outlaw Movement" popularized by artists such as David Allan Coe, Waylon Jennings, Willie Nelson, Billy Joe Shaver, and Merle Haggard. His first job in music was for music legend George Jones for whom he played bass and steel guitar. He later co-wrote Jones' hit song "Once You've Had the Best." 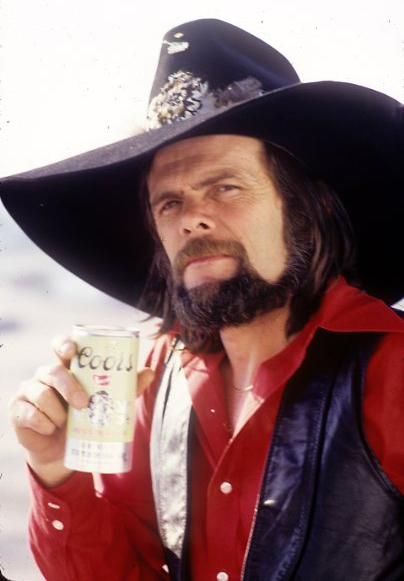 In 1964, he changed his name legally to Johnny Paycheck, taking the name from Johnny Paychek, a top ranked boxer from Chicago who once fought Joe Louis for the heavyweight title. His name was a play on the name of country singer Johnny Cash. He also performed as "Donny Young." Paycheck was a tenor similar in style to other "hard country" performers in the late 1950s and early 1960s such as Ray Price. Paycheck, along with Willie Nelson, worked in Price's band the Cherokee Cowboys. He is featured as a tenor singer on recordings by Faron Young, Roger Miller, and Skeets McDonald. All of these recordings are recognizable by their honky tonk purism. Known as the "Countrypolitan" sound, the recordings feature steel guitars, twin fiddles, shuffle beats, high harmony and self-effacing lyrics instead of vocal choruses and strings. 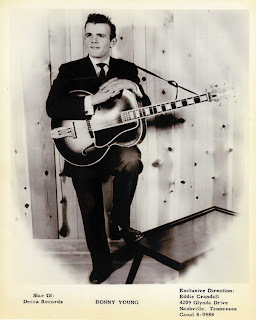 As George Jones' tenor singer, Paycheck is said to have helped Jones develop his unique vocal phrasing In 1960, he reached Top 35 status in Cashbox magazine's country charts as Donny Young with the tune "Miracle Of Love." From the early to mid-1960s, he also enjoyed some success as a songwriter for others, with his biggest songwriting hit being "Apartment No. 9", which served as Tammy Wynette's first chart hit in December 1966. In the 1980s, his music career suffered from his problems with drugs, alcohol, and legal difficulties. However, in 1981 he did appear on the television show, The Dukes of Hazzard, as himself. He served a prison sentence in the early 1990s. The most successful of his later singles, released during his appeal, was "Old Violin" which reached # 21 on the country chart in 1986. His last album to chart was Modern Times in 1987. He continued to release albums, the last of which, Remembering appeared in 2002. Although Paycheck suffered from drug and alcohol addiction during his career, he later was said to have "put his life in order" after prison. He continued to perform and tour until the late 1990s. Suffering from emphysema and asthma after a lengthy illness, Paycheck died at Nashville's Vanderbilt University Medical Center in 2003. She was 37-years-old when she died from a self-inflicted gunshot wound on her front porch; one month after the death of her boyfriend. She had two young children. Born Melinda Gayle McCready in Fort Myers, Florida, McCready began singing in church at age 3, and graduated from high school at the age of 16 with the intention of beginning her music career early. 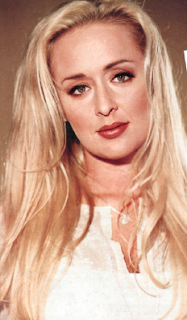 Since 1996, Melinda Gayle "Mindy" McCready has recorded a total five studio albums. When she was 18, she moved to Nashville, where she was signed by BNA Records. Her debut album, Ten Thousand Angels, was released in 1996 and sold two million copies. The album produced four chart singles on the country charts: the title track at #6, followed by her only Number One hit, "Guys Do It All the Time." This song, in turn, was succeeded by "Maybe He'll Notice Her Now," a duet with Richie McDonald, then the lead vocalist of Lonestar. The fourth and final single, "A Girl's Gotta Do (What a Girl's Gotta Do)," peaked at #4. In 1997, she released If I Don't Stay the Night was certified gold. 1999's I'm Not So Tough, did not sell that well, and she was dropped from the label. A self-titled fourth album followed in 2002 on Capitol Records. In April 2008, the New York Daily News reported on a possible long-term relationship between McCready and baseball star Roger Clemens that began when she was 15 years old. Clemens' attorney denied the affair and also stated that Clemens would be bringing a defamation suit regarding this false allegation. Clemens' attorney admitted that a relationship existed, but described McCready as a "close family friend." He also stated that McCready had traveled on Clemens' personal jet and that Clemens' wife was aware of the relationship. Clemens issued a statement saying only that "I have made mistakes in my personal life for which I am sorry." However, McCready confirmed the relationship as being sexual in nature. On November 17, 2008, McCready spoke in more detail to Inside Edition about her affair with Clemens. She stated that their relationship lasted for more than a decade, and that it ended when Clemens refused to leave his wife to marry McCready. However, she denied that she was 15 years old when it began, saying that they met when she was 16 and the affair only became sexual "several years later. A pornographic videotape of McCready and an ex-boyfriend referred to as "Peter" went on sale in April 2010. McCready has claimed the video was stolen from her home three years earlier. In June 2009, McCready signed on to appear on the reality series Celebrity Rehab with Dr. Drew.McCready's critically acclaimed fifth album, I'm Still Here, was released in March 2010. ... born on May 21, 1940, he was 72-years-old when he died. 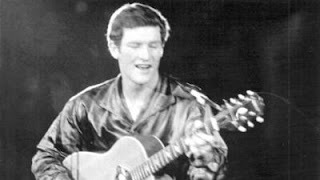 Born Anthony Esmond Sheridan McGinnity in in Norwich, Norfolk in the U.K., Tony Sheridan was an English rock and roll singer-songwriter and guitarist. 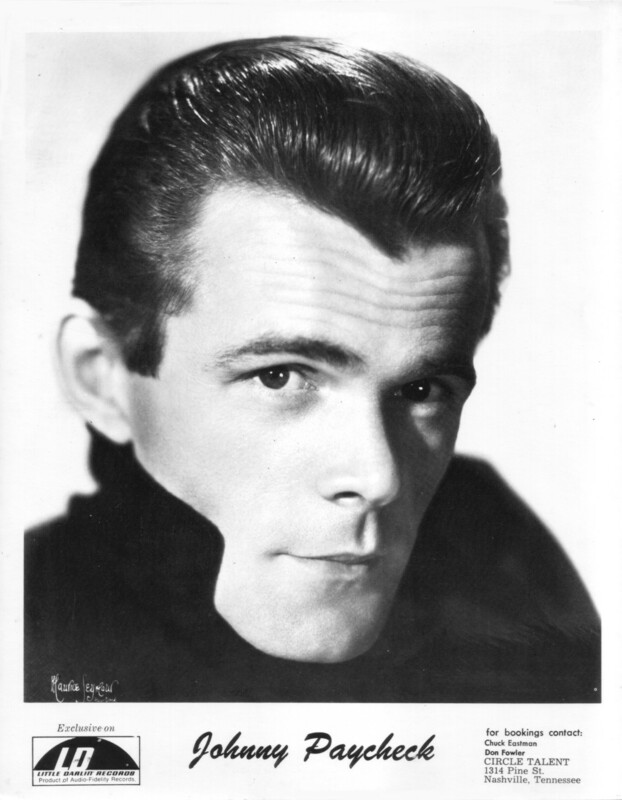 He was best known as an early collaborator of The Beatles, (though the record was labelled as being with "The Beat Brothers"), one of two non-Beatles (the other being Billy Preston) to receive label performance credit on a record with the group, and the only non-Beatle to appear as lead singer on a Beatles recording which charted as a single. Sheridan’s first musical influence came from his parents' interest in classical music, and by age seven, he had learned to play the violin. 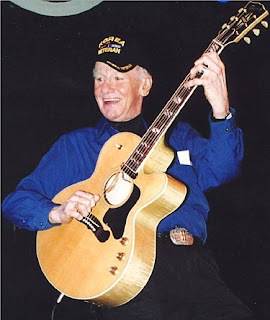 He eventually learned to play guitar, and in 1956, formed his first band. He showed enough talent that he soon found himself playing in London's "Two I's" club for some six months straight, while sleeping in doorways. 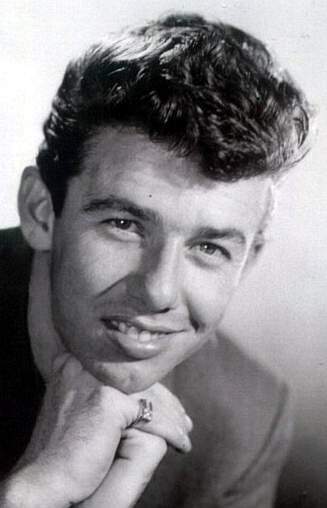 Sheridan was soon viewed as a very promising guitarist and backed a number of singers, including Gene Vincent and Conway Twitty while they were in England. Early in 1960, Sheridan performed in a tour of the United Kingdom which also included Gene Vincent and Eddie Cochran. On April 17 of that year, he barely escaped the road accident which would leave Cochran dead and Vincent badly injured. Despite his success, his penchant for being late, showing up without his guitar, etc., cost Sheridan much of his professional standing in England. His band was offered a gig in Bruno Koschmider's "Kaiserkeller" club in Hamburg, Germany, but his bandmates soon packed up and left Germany, leaving Sheridan behind. 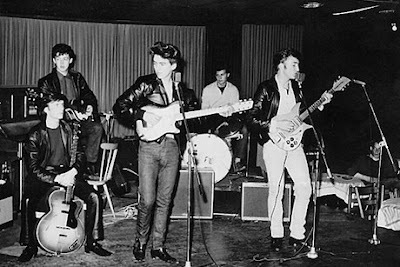 A young Liverpool rock group was then booked by Liverpool club-owner/manager Allan Williams to play in Koschmieder's second club "The Indra", and thus the young, raw Beatles had the chance to play with Sheridan and his now makeshift band. This face to face contact rapidly grew into mutual great admiration, particularly on the part of young George Harrison, who, as lead guitarist for the Beatles, never missed a chance to corner fellow lead guitarist Sheridan and practice with him. In 1961, the Beatles, which then included Pete Best, recorded together after German Polydor producer/A and R man Bert Kaempfert saw the pairing on stage. Of the seven songs recorded during Sheridan's two day-long sessions for Polydor in June 1961, at times the band behind Sheridan would be down to only two Beatles, and on their two solo songs did all four Beatles play (minus Sheridan.) These sessions produced Sheridan's "My Bonnie" and "The Saints", and the Beatles' "Ain't She Sweet" and "Cry for a Shadow" (formerly titled "Beatle Bop"), plus three other songs. Polydor's beliefs in Sheridan's coming stardom were so strong that they buried the two solo Beatle tracks until much later. 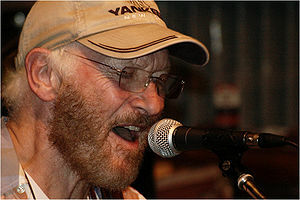 Both John Lennon and Tony Sheridan have said there were several other Beatle tracks that were recorded during the two-day session, but they have not resurfaced. In 1962, after a series of singles (the first of which, "My Bonnie"/"The Saints" made it to number 5 in the UK singles chart), the record was released in America on Decca with a black label and also in a pink label for demo play. The record has the distinction of being one of the most expensive collectible 45 rpm with the black label in mint condition selling for $15,000 in 2007 and the pink label selling for $3000. Ringo Starr also very briefly played in Sheridan's backing band during very early 1962, before returning to Rory Storm and the Hurricanes. 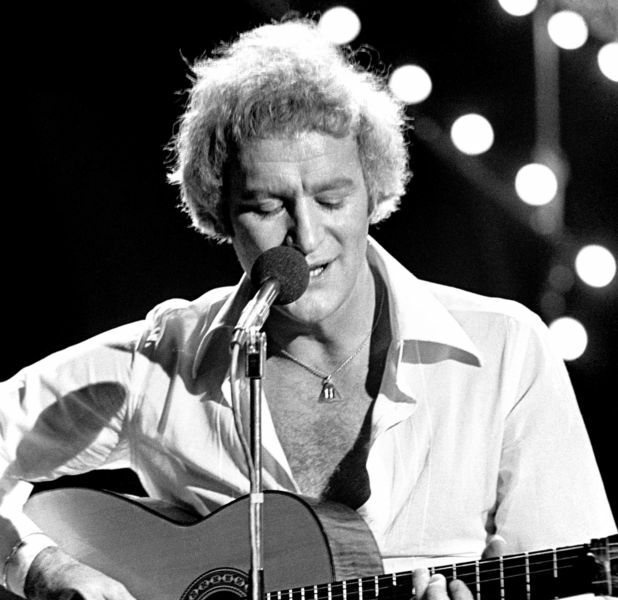 Starr was reportedly unhappy with Sheridan performing songs he had not rehearsed with his band. After the Beatles gained fame, the album was re-released in the United Kingdom, with the credit altered to "Tony Sheridan and The Beatles". 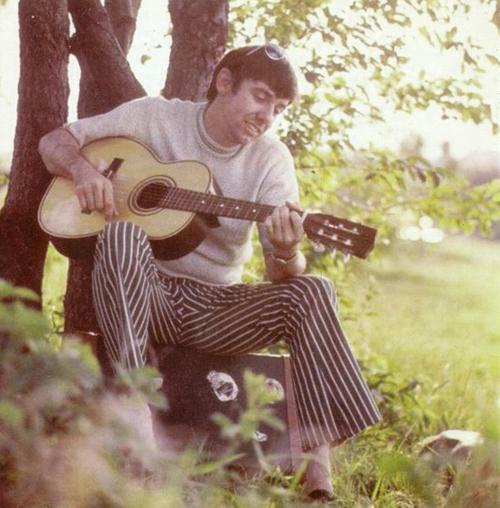 In the mid-Sixties Sheridan's musical style underwent a transformation, away from his rock and roll roots and towards a more blues- and jazz-oriented sound. Though these recordings were praised by some, many fans of his earlier work felt disappointed. Sheridan continued performing in Hamburg at the same club for a number of years, but eventually Polydor dropped him as a recording artist. In the early 1970s, Sheridan managed a West German radio programme of blues music, which was well received. In 1978, the Star Club was reopened, and Sheridan performed there along with Elvis Presley's TCB Band In 1991 Joe Sunseri, Sheridan biographer and then-manager, completed Nobody's Child: The Tony Sheridan Story. However, due to a falling-out, the biography remained unpublished. ... he was 73-years-old when he died after a long battle with colon cancer. Hawkins was a pioneer American rock singer, songwriter, and rhythm guitarist who was often called the architect of swamp rock boogie. Fellow rockabilly pioneer Ronnie Hawkins was his cousin. In 1957, Hawkins was playing at Shreveport, Louisiana clubs. Combining the influence of Elvis Presley, the guitar stylings of Scotty Moore, with the heavy blues sound of black Louisiana artists he recorded his swamp-rock classic, "Susie Q," with fellow Louisiana guitarist and future Rock and Roll Hall of Famer James Burton provided the signature riff and solo. The song was chosen as one of The Rock and Roll Hall of Fame's 500 Songs that Shaped Rock and Roll. Creedence Clearwater Revival's version of the song on their 1968 debut album helped launch their career and today it is probably the best known version. … he died from pancreatic cancer. Paul Irvin Roby was born on August 20, 1931 in New Orleans, Louisiana. 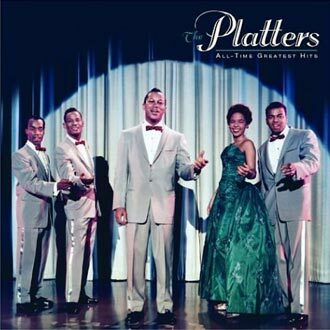 The Platters formed in Los Angeles in 1953 and became one of the top vocal groups of the 1950's, selling 53 million records. The group underwent numerous line-up changes. In 1954, lead vocalist Cornell Gunter, Alex Hodge and Joe Jefferson were out and Paul Robi, new lead Tony Williams and a female, Zola Taylor were in. joining Herb Reed and David Lynch. The resulting lineup - the one remembered for the group's biggest and most lasting hits - lasted until 1960. As a group, the Platters began to have difficulties with the public after 1959, when the four male members were arrested in Cincinnati on drug and prostitution charges. Although none were convicted, their professional reputation was seriously damaged and US radio stations started removing their records from playlists, forcing the group to rely more heavily on European bookings. Robi left the group in 1965. The group had 40 charting singles on the Billboard Hot 100 chart between 1955 and 1967, including four no. 1 hits. The Platters were inducted into the Rock and Roll Hall of Fame in 1990, the Vocal Group Hall of Fame in its inaugural year of 1998 and the Hit Parade Hall of Fame in 2009. The Platters were the first rock and roll group to have a Top Ten album in America. They were also the only act to have three songs included on the American Graffiti soundtrack that sparked an oldies revival in the early to mid-1970s: "Smoke Gets in Your Eyes," "The Great Pretender" and "Only You (and You Alone.)"